Each week, Voice of Russia hosts Red Line, a discussion about the events of the week, as seen from Moscow. This week, events in Libya, Russia's liberal opposition and the new president of Kosovo. Sergei Strokan: This week we start with Libya, then we would see how the Russian opposition has responded to the publication of its recent political manifesto in the Western media and finally we end with the scandalous presidential election in Kosovo. Mira Salganik: These are the last words of Georges Jacques Danton, a leader of the French revolution who was sentenced to death by his former comrades. That’s what he said minutes before he was beheaded. Are you comparing him to Mr. Gaddafi? Sergei Strokan: In a way. I think that what we are witnessing now in Libya is another twist of history. Muammar Gaddafi has been faced with the new breed of revolutionaries who finally came for his head. I want to quote what struck me most of all about his TV address. This is what Gaddafi said: “I am in Tripoli and not in Venezuela. Do not believe the channels belonging to stray dogs.” This was his main message after days of protests. Although he tries to look defiant these days, to me it is obvious that the game is almost over and the country is sliding into chaos. Mira Salganik: These protests, which you claim have sent the country into chaos, seem to have united almost everyone – men in the street, religious and tribal leaders, army and police officers in Tripoli and Benghazi and finally Libyan diplomats in New York and elsewhere. On the one hand, there is a kind of unity in this movement, on the other, there is a division into clans, into tribes. Mira Salganik: Libya has already passed the point of no return, but the question is: What comes next? Sergei Strokan: I don’t want to make too many parallels between the Tunisian, Egyptian and Libyan scenarios, although all three of them, to my mind, vividly demonstrate a new phenomenon – signs of a new Pan-Arab identity. For the first time in their post-colonial history Arab nations are rising not against Israel or the U.S., but against political stagnation and social injustice in their own countries. Let us hear a voice from the region. We are joined by Mohamed Yeslem Beissat, an expert on North Africa. Ekaterina Kudashkina spoke to him. Mohamed Beissat: What is happening in Libya is totally unacceptable. It’s condemnable and lamentable. The people have a right to demonstrate, they have a right to speak and express their views. I am very saddened that it is happening. Ekaterina Kudashkina: I’ve seen strange reports that al-Qaeda allegedly claims that it is taking over in Libya. How realistic is that? Mohamed Beissat: That is totally rubbish. Libyan people want to live in peace and harmony. They just want to take command of this country and its future. Ekaterina Kudashkina: Is there any news concerning Muammar Gaddafi? Mohamed Beissat: He had a telephone interview with the Libya television and repeated what he said earlier. Ekaterina Kudashkina: That he was prepared to become a martyr in Libya? Mohamed Beissat: Something like that. Ekaterina Kudashkina: Isn’t it strange? Some 40 years ago he was a popular leader, wasn’t he? What happened to him over time? Mohamed Beissat: He was a pan-Arab nationalist. That was something like Nasser’s phenomenon in Egypt. Ekaterina Kudashkina: What is going to happen next? His son is not that popular either. Mohamed Beissat: He has no legitimacy. I was surprised that he spoke to people. Who is he to give himself authority to do so? Ekaterina Kudashkina: And what about his other sons? Mohamed Beissat: All of them the same. Ekaterina Kudashkina: Does this mean an end to Gaddafi rule? Mohamed Beissat: It is the end of what is happening in Libya, the end of the regime and the beginning of another one. This is actually a very sad state of affairs and it takes too long to be finished. Ekaterina Kudashkina: Does the opposition have anyone to be named as successor? Mohamed Beissat: Anything that may come will be better than this guy. Ekaterina Kudashkina: Do you consider this to be a rather universal phenomenon, that people who remained in power for so long tend to develop into a kind of monster? Mohamed Beissat: This case is unique. He is not well in his mind and his ruling, shooting and killing his people, with no Constitution and no laws. He behaves like a gangster. I don’t remember cases of such a phenomenon, at least in modern history. Ben Ali and Mubarak have constitutions, parties, parliaments and laws. And in Libya we deal with a one-man show. Ekaterina Kudashkina: Do you think he is going to be another martyr? Mohamed Beissat: He will not leave the country. Unable to see the reality as it is, he will be there until he dies. And that is not very far away. Someone will kill him. Sergei Strokan: And now welcome to the Red Line’s second heading –Between the Lines in which we usually discuss the most interesting article of the week. Yet, this time I suggest we take up a story called “No More Western Hugs for Russian Rulers” run by The Washington Post. It is written by the four leaders of a Russian opposition party who known as staunch critics of the Medvedev-Putin duo. Mira Salganik: Let’s say a few words about the authors. Sergei Strokan: Like I said, there are four of them - Mikhail Kasyanov, Vladimir Milov, Boris Nemtsov and Vladimir Ryzhkov. They position themselves as co-chairs of the People's Freedom Party of Russia. Mira Salganik: To be frank, I have not heard much about this party, however, all the names you’ve mentioned, are well-known. Sergei Strokan: In fact, none of them is a newcomer to Russian politics. As you remember, Mikhail Kasyanov served as finance minister during President [Boris] Yeltsin’s time, then as the prime minister under President [Vladimir] Putin and joined the opposition after resigning from the cabinet. Boris Nemtsov was a deputy prime minister during Boris Yeltsin’s era. At one point he was even considered for the role of Yeltsin’s successor. Another author is Vladimir Milov who at one time was a cabinet member. And finally, Vladimir Ryzhkov is also an old bird in Russian politics - a duma deputy for some time. Mira Salganik: What is the point they are making in this article? Mira Salganik: One may agree or disagree with their statement, but what do they propose? Do they have a coherent alternative program? Sergei Strokan: Not really, and this is my main objection. There is no program as such, let alone a coherent one, I would say. Mira Salganik: But it ends up with what I think amounts to a solemn oath. “We are sure that we can achieve our goals through freedom and the normal democratic process - provided we get these restored in our country.” Are they ready to restore it? Sergei Strokan: The manifesto in itself evokes mixed feeling. I think the authors are right in exposing the perils of Russia’s corruption. It is an open secret that Russia is an utterly corrupted state, that corruption is a serious threat to its very existence, not to mention modernization. But I can’t buy the notion that Medvedev is not fighting corruption, this is not true, we should say this openly. Mira Salganik: The publication of the story coincided with a series of high-profile dismissals from offices in the upper echelon of Russian power. In his anti-corruption drive Medvedev sacked the prosecutor-general of the Moscow region and the deputy head of Russia’s all-powerful Federal Security Service – successor of the KGB! Sergei Strokan: I don’t understand the logic of attacking the president at this particular point. It looks irrelevant. I think they simply miss the point. Mira Salganik: Well, if the opposition doesn’t like the leadership, it should at least make an attempt to take the power—this is true in any country, not only in Russia—either through the election process or through the revolutions we are witnessing today in the Middle East. Real opposition has to have guts. It is a fact that this kind of opposition does not have an election base in Russia. They should make their message loud and clear to be heard by masses. They should contest and win the elections. There is no other way. But it seems they prefer to assure the West that the next round of elections is going to be rigged. Sergei Strokan: So they want the West to do the job for them? I suppose it only indicates the low morale of the Russian liberal opposition, which is deeply regrettable to me. But we in this country definitely need opposition, as we are not a Middle East type of regime and we want politics to have a different foundation. Now I suggest that we listen to an interview with Dr. Ariel Cohen, Senior Research Fellow at the Heritage Foundation in Washington. He was interviewed by Ekaterina Kudashkina. Ekaterina Kudashkina: The authors are saying that “kisses and hugs” - the way they put it - have failed. Is that correct and what could they imply? Ariel Cohen: There is the election campaign coming up this year for the Duma and the presidential campaign next year. The four leaders of the democratic opposition - the Party of People’s Freedom - believe that their party is not going to be treated very well in these election campaigns. The democrats think that the reset policy between the West and Russia allows discrimination against the opposition, including their party, in the election. Ekaterina Kudashkina: What could the West do in this situation? Ariel Cohen: What the authors of the article in the Washington Post suggest is that the West balances at least its pursuit of business opportunities in strategic cooperation, like arms control and Afghanistan and Iran cooperation, with a stricter position on Russian democracy, human rights, etc. They specifically are talking about the Khodorkovsky trial, the Magnitsky death in jail, access to television and other issues that even President Medvedev talks about, like police corruption or abuse of the court system. So, there is an overlap in this agenda between, I would say, President Medvedev and the democratic opposition. And I think it is in Russian interests to allow the democratic opposition to be in the Duma and to have a viable candidate in the presidential elections of 2012, provided the democrats would agree on one such viable candidate. So far they have demonstrated that they don’t agree on such a candidate. Ekaterina Kudashkina: They also say that western nations could introduce targeted sanctions against the officials. Could a sanction regime really work? Ariel Cohen: We did not have a sanction regime against Russian officials, and we are talking about specific people who commit specific violations, such as allowing Magnitsky to die without medical care in jail. But there are other countries against which targeted sanctions were applied or are applied, like Belarus and Iran. So, I cannot tell you whether it is going to be effective or not because this was never tried. Ekaterina Kudashkina: As you said, Medvedev also speaks about fighting corruption and other issues we are aware of. Perhaps members of that party could be more efficient in fighting corruption? Ariel Cohen: Clearly, law enforcement officials should not take bribes, should not take protection money from casinos, as we just found out is happening in the Moscow region. In order to fight that, you probably have to do what several countries in Eastern Europe have done before: look for new people, give them good salaries, hire the new contingent and if anyone is caught taking bribes or providing undue services, they should not only lose their jobs but also lose their freedom and go to jail for corruption. And the second thing is that it is not just a traffic policeman who stops your car for being dirty or not having little light blinking or something like that - there should be generals, there should be ministers and deputy ministers in this law enforcement vertical, in this law enforcement structure. Only then, when there is “a fear of God” in these people that they violate their sacred duty to protect people, corruption struggle is going to be efficient and effective. Clearly, when generals own airplanes or multimillion-dollar villas and drive very expensive foreign cars - that should be a subject for investigation of the source of their income and if there is even a suspicion of taking bribes or receiving from businesses that they provide security or protection services, these people have to be punished and kicked out of their jobs. The free press is very important in fighting corruption because they take up this information and publish it. Freedom of the press has to be protected by the Duma, by the executive branch and by the courts. The journalists should not be attacked and touched if they are digging up dirt on corrupt officials. But media will not achieve what law enforcement and courts have to achieve, which is to have people who violated the law and give them punishment that they deserve. Ekaterina Kudashkina: What will be the best conditions to implement that splendid program? Ariel Cohen: I think that politicians, who fight for political power and feel that they do not have equal access to the media, appeal to foreign media because they feel like the dissidents felt in the Soviet era that there’s too much pressure from the authorities. In view of what is happening in the Middle East, the lessons should be not more a crackdown but less effort to keep down the opposition and more effort to bring the democratic opposition, which is in favor of modernization and integration of Russia, into the global economy. There is more need for the ruling party, the United Russia, to cooperate with its people. Sergei Strokan: Now we are turning to Red Line’s concluding heading: Man in the News. This time the man of the week is Behgjet Pacolli, the newly elected president of Kosovo, whose nomination, which was approved by Kosovo parliament this Tuesday turned into a fresh scandal as the opposition accused him of buying votes on the eve of the final voting. Millionaire-turned president, Behgjet Pacolli is a much discussed figure in Russia, as his Swiss-based construction firm refurbished the Kremlin in the late 1990s, but he is also well-known in the Balkans and Europe. It is an open secret that Pacolli is viewed with suspicion by many Kosovars due to his close links to Russia. Mira Salganik: It is true that in Russia, Kosovo’s newly elected president is known as the central figure of a Kremlin reconstruction scandal that involved a number of people close to former President Boris Yeltsin. Sergei Strokan: Moscow-based daily Kommersant reminds us that Pacolli, now the New Kosovo Alliance leader, came to Russia in the early 1990s when his Switzerland-based company Mabetex Group was commissioned first to carry out projects in the Republic of Sakha (Yakutia). Mira Salganik: There he made friends with Pavel Borodin who in 1993 became the head of the Presidential Property Management Department. Soon Pacolli’s firm was hired to reconstruct the Kremlin, the Shuyskaya Chupa presidential residence, government headquarters and headquarters of the State Duma. Sergei Strokan: In 1996, the Mabetex office in Lugano, Switzerland was searched at Russia’s request and Pacolli was questioned by then-Swiss State Prosecutor Carla Del Ponte. 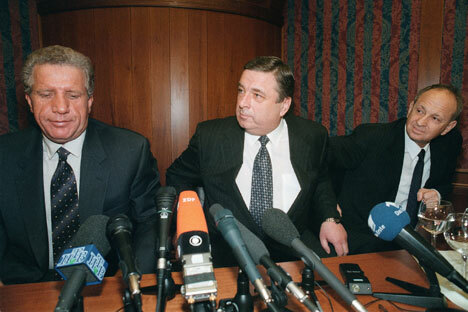 Swiss authorities charged Pacolli with money laundering and giving huge bribes, but the proceedings in Russia were dismissed in December 2000 and Switzerland closed the case in March 2002. Now he emerges as president of Kosovo, a head of state that is to discuss international problems in Brussels, Washington, Belgrade and even in Moscow. Mira Salganik: In Kosovo, the president is elected by parliament as we learned and it is the ruling party – or coalition – that nominates the candidate. It must be remembered that although president has less power than the prime minister, he is by no means a ceremonial figure. Moreover, according to the Albanian media, the New Kosovo Alliance will appoint one deputy prime minister and four ministers, whose portfolios are not clear yet. Sergei Strokan: Whereas the Serbian parties will have three ministers. The other minorities will divide two posts – of a minister and of a deputy prime minister. However, neither the president of Kosovo, nor its prime minister could hope to gain a position of respect in world politics, alas. Pacolli may be, as he himself declared, “the richest Albanian in the world,” but his scandalous exploits in Russia will hardly be forgotten. At any rate now that that Kosovo does have a government – more than two months after the election – Brussels can start working on its long-cherished project of dialogue between Belgrade and Pristina. But let us finally listen the voice from the Balkans. Now we are joined by Ivan Zvonimir Čičak, Chairman of the Croatian Committee for Human Rights. Ekaterina Kudashkina spoke to him. Ekaterina Kudashkina: What does Pacolli’s election mean for the future of Kosovo? Ivan Zvonimir Čičak: When I visited Kosovo the last time - and that was several years ago—the country seemed very chaotic to me. They have a lot of unemployed young people. No future, you know. And they have gone to Europe, to Switzerland where there is a big community of Kosovo Albanians and all over the world. I spoke to a group of people in Kosovo and said to them that the best revenge for you is that now your policemen will arrest Kosovo nationalists. When I was there nobody paid for electricity, gas water and so on and now they have to pay. Ekaterina Kudashkina: Pacolli’s interests spread all over the western. What is his business? Can his business have a positive impact on the situation in Kosovo? Ivan Zvonimir Čičak: This question can be as well put to politicians in Croatia, Serbia and Russia. Where do you get your money from? Do you know how do Lebedev and Abramovich earn their money? In all former communist countries, there are such people and such money of unknown origin. This is a big problem for all of us. The question is how long this transition will last. Things are now getting even worse in North Africa. How will it affect stability in Europe, given that a million people from Libya are going to come to Europe? How many people will come from Egypt, Tunisia, Morocco and Algeria after they run short of food? The first step for Kosovo should be a normalization of relations with Serbia. I don’t think it will be very easy. Ekaterina Kudashkina: Is there any help coming from outside, from the EU and international organizations? Help, not investments. Ivan Zvonimir Čičak: The real help is to invest money. Most aid coming to Europe is from Germany. Ekaterina Kudashkina: Let’s hope that Mr. Pacolli’s election helps, to an extent at least. Ivan Zvonimir Čičak: He has no big role. He is needed to show that the country has a leader. He is of certain importance on the symbolic level. He has connections with the world and Russia in particular. This may help Kosovo mend relations with Serbia.